Join me for the first one of 2019! 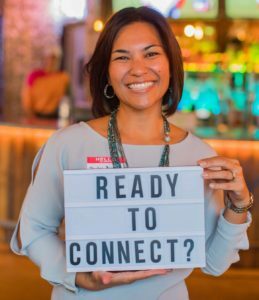 The Social Connect Business Happy Hour combines three things: education, connections, and inspiration at our new home Dave & Busters in Tempe. Learn how to network with a purpose in my talk from 4pm to 4:45pm, mix and mingle with other social connectors from 5pm to 6pm, then hear from other entrepreneurs and business professionals in my off-the-cuff, raw and real Success over Struggle speaker panel where I interview them in front a live panel. The event ends at 7pm, but the social hour doesn’t have to! Stay a while and enjoy trivia games and dancing with Dave & Busters. Guests also receive game tickets when they spend $20 during their visit.